FC Halifax Town‘s winless run was extended to seven games as Tranmere Rovers inflicted a 4-2 defeat on the Shaymen in the National League today. Rovers ended Town’s FA Cup adventure at the first hurdle two Saturdays ago and another scintillating attacking performance, this time at Prenton Park, helped Micky Mellon’s men to a convincing triumph. There was a fabulous early double from James Norwood and second half goals from Larnell Cole and Dylan Mottley-Henry. Matty Brown and debutant Daniel Batty responded for Town. Billy Heath made five changes to the Halifax team which had lost 2-0 at home to Maidstone United in midweek. 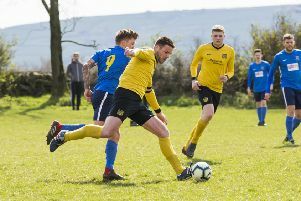 Sam Johnson was deemed fit after suffering a back spasm which kept him out against the Stones and Tom Denton returned to the starting 11 after serving a three-match suspension. Nathan Hotte, was unavailable after picking up his fifth booking on Tuesday, which allowed new loaning signing Batty, who has joined from Hull City for a month, to play. Batty teamed up with David Lynch, making his sixth start of the campaign, in the centre of midfield alongside Connor Oliver. Cliff Moyo replaced Josh Macdonald as Billy Heath opted to utilise a 3-5-2 formation, with Matty Kosylo next to Denton up front. Mellon had been delighted with Tranmere’s “professional” display in the FA Cup and he should have been purring with pride at how his Rovers team started and had a two-goal cushion after only 15 minutes. It could, or possibly should, have been a lot more as the half wore on. It only took Connor Jennings five minutes to open the scoring at The Shay and it didn’t take Norwood too much longer at Prenton Park. The warning signs were there inside the opening 90 seconds when Liam Ridehalgh produced a teasing cross from the left but Josh Wilde was equal to it with a headed clearance under pressure. Tranmere had more success from their next delivery. Jay Harris was the provider from the right to find and Norwood delightfully swept the ball into the far corner past a helpless Johnson. Norwood should have had a second three minutes later when he met another cross from the right but Scott Garner prevented the ball from crossing the line. A looping header from a white shirt landed just wide from the resulting corner. Garner was booked for a foul on Jennings as Tranmere continued to attack at will and their confidence was summed up by a cheeky Steve McNulty back-heel which deceived Denton and found the captain’s centre-back partner Ritchie Sutton. Town’s first meaningful attack, on 14 minutes, resulted in Rovers doubling their lead. A corner found Kosylo on the edge of the box but after he was dispossessed, the home side launched a blistering counter-attack. Batty was outpaced and outmuscled and when Jeff Hughes’ volley into the ground fell kindly for Norwood, the former Forest Green striker made no mistake in nodding the ball past Johnson for his fifth goal of the season. Norwood then went from scorer to creator as he selflessly denied himself a hat-trick. He easily glided past the yellow-carded Garner and cut the ball back to Jennings but his shot was brilliantly saved by Johnson. Brown had Town’s first attempt on target after 20 minutes but his header from a deep Cliff Moyo cross was straight at Scott Davies. Rovers went straight to the other end but Norwood couldn’t latch onto a powerful low cross. Much to the Shaymen’s delight, that was Norwood’s last contribution as he was forced off through injury and he was replaced by Larnell Cole, who only signed 24 hours earlier. Gerry McDonagh prodded an effort straight at Johnson but Heath, having seen Tranmere outclass his side, switched the formation to 4-5-1. The tweak nearly paid off when Denton had two opportunities from a Kosylo free kick but both were cleared by a battling defensive unit. There were more changes to the Town side line-up six minutes before the interval when Moyo was replaced by Josh Macdonald, which meant Wilde moved to right-back, Scott McManus dropping into the left-back position and Kosylo moving out onto the left-wing. Rovers tried to take advantage of Town’s disjointed look when Cole nearly became an instant hero with the Prenton Park faithful but his rasping, ambitious drive flew harmlessly over Johnson’s bar. There was a certain amount of relief when the whistle signalled half-time but Heath sent his players out early for the second half, which they started with vibrancy and vigour as Kosylo forced a smart save out of Davies. The pacey Macdonald then sprinted down the right and did brilliantly to win a corner, which was headed in by Brown for his third goal of the season. Town’s joy was short-lived as, straight from the kick-off, Tranmere regained their two-goal lead as Cole made it a memorable debut when his low effort was deflected past a stranded Johnson, who had committed himself to his right, with the ball beating him at his near post. Rovers extended their lead just before the hour-mark but it was a goal which should have been avoided. A sloppy pass across the centre circle sold McManus short but Mottley-Henry was on hand to intercept. The former Bradford City youth player raced clean through on goal before keeping his composure to finish neatly under Johnson. The chances continued at both ends as Denton, in acres of space, fired wide before Cole was denied a second by Johnson. Halifax did pull one back through their own debutant Batty when his deflected low drive gave Davies no chance. McNulty then denied Denton a certain goal after more great play from Macdonald but Town were unable to produce what would have been a remarkable comeback against a Rovers side who leapfrog the Shaymen in the table. Tranmere: Davies, Ridehalgh, Sutton, McNulty (C), Harris, Norwood (Cole 26 (Cook 78)), Jennings, Mottley-Henry, Duggan, McDonagh, Hughes. Subs not used: Pilling, McEveley, Norburn. FC Halifax Town: Johnson, Wilde, Garner, Brown (C), Moyo (Macdonald 39), McManus, Lynch, Batty, Oliver (Clarke 67), Kosylo, Denton. Subs not used: Nicholson, Tomlinson, Morgan.